We have finished three weeks of the Kansas high school football season, and district play will begin for most classifications this week. Let’s find out how our voters have adjusted the top five in each classification as we begin district play. Derby stays on top of the Class 6A poll after a 55-7 victory at Newton. The Panthers scored 21 points in each of the first and second quarters. Through three weeks this season, Derby’s average margin of victory is 51 points per game, and the Panthers are averaging more than 46 points per game – in the first half! Derby travels to Bishop Carroll this week. Another week, another shutout for second-ranked Lawrence Free State. Free State beat Shawnee Mission North, 62-0 on Friday. The Firebirds are one of five teams left in the state (Maize, Scott City, Jackson Heights, Madison) that have yet to allow a point. This week, Free State will take on Shawnee Mission West (0-3). Blue Valley cruised to a 49-7 victory over Blue Valley Southwest. The third-ranked Tigers got 280 passing yards and five touchdowns from senior quarterback Walker Kinney. Blue Valley has a showcase inter-state matchup this week against Rockhurst (Mo.). The Hawklets are 3-1 on the season having won three straight games. Olathe North stays in the No. 4 this week after a 51-14 victory over Shawnee Mission West. The typically run-heavy Eagles added 211 passing yards by Arland Bruce, IV on Friday, in addition to rushing for 273 yards. No one in the top five had a more impressive win than No. 5 Manhattan last week. The Indians traveled to Topeka and came away with a 49-7 win over the previously-unbeaten Seaman Vikings. Kevontae McDonald rushed for 190 yards and four touchdowns to lead the Manhattan offense. The Indians have another tough road test this week when they go back to Topeka to take on Washburn Rural. Wichita Northwest stays at No. 1 after a shootout victory over Great Bend. The Grizzlies raced out to a 49-14 lead early in the third quarter, but allowed Great Bend to score 20 consecutive points to pull within 49-34. Northwest then responded with a time-consuming drive that resulted in a touchdown and ultimately a 56-34 victory. St. Thomas Aquinas picked up a 49-14 victory over Blue Valley Southwest on Friday. The Saints scored 21 points in each of the first two quarters in leading 42-8 at halftime. Tank Young went over the 200-yard mark for a second game this season with 228 yards and four touchdowns. Young now has 635 rushing yards and nine touchdowns this season. Aquinas hosts No. 5 Mill Valley this week. Third-ranked Bishop Carroll tuned up for this week’s showdown with Derby with a 49-20 victory over Wichita West. Last season, Derby won the battle of elite programs, 54-45. Maize moves up a spot to No. 4 this week after an impressive 21-0 shutout of Haysville Campus. The Eagles, which had scored 49 points in each of their first two games, were held to just 14 points and a kickoff return for a touchdown by Camden Jurgensen. Mill Valley falls just one spot this week after a 40-7 loss to Class 4A No. 1 Bishop Miege. The Jaguars were within striking distance until Miege returned a blocked punt and a fumble for touchdowns in the second quarter. Mill Valley gets very little time to rebound as the Jaguars take on No. 2 St. Thomas Aquinas this week. 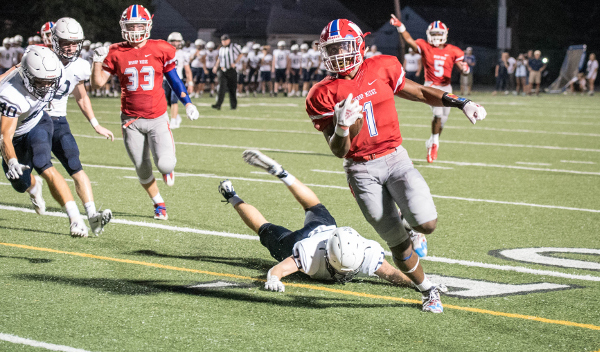 Bishop Miege pulled away for a 40-7 victory over Mill Valley. Brison Cobbins rushed for two touchdowns and the Stag defense and special teams each contributed touchdowns to build a 26-0 halftime lead. Cobbins would add his third touchdown run in the second half as the Stags won their 28th straight game. McPherson remains ranked second after their 56-8 road victory over El Dorado. Jace Kinnamon rushed for 145 yards and four touchdowns to lead the Bullpups. Third-ranked Pittsburg returned two interceptions for touchdowns in building a 17-point lead against Blue Valley North. The Mustangs then scored three consecutive touchdowns to take a 31-27 early in the fourth quarter. The Purple Dragons would answer with the game-winning score on a 17-yard screen pass from Ty Roark to Brett Freeman for a 34-31 victory. The Dragons will host rival Fort Scott this week. Goddard remains in the No. 4 spot, barely in front of No. 5 Paola. Goddard escaped with a 17-16 overtime victory over Andover Central last week, while Paola rolled to a 59-13 victory over Ottawa. The Lions will take on rival Goddard-Eisenhower this week, while Paola will travel to Spring Hill. Andale cruised to a 62-0 victory over Rose Hill. The Indians got three rushing touchdowns and a passing score from Ethan Baalmann. Andale rushed for 266 yards in the game. Andale begins district play at Haven. Second-ranked Sabetha held off No. 5 Perry-Lecompton 35-33 in one of the better games of the young season. The Bluejays led 35-19 late in the third quarter after an exceptional run by Gabe Garber where he broke seven tackles. Perry-Lecompton would respond with two Dalton Kellum touchdowns, the second coming with 57 seconds in the game to pull within 35-33. The Kaws’ two-point conversion attempt was knocked down by a Sabetha defender preserving the two-point win. Despite the loss, our voters left Perry-Lecompton in the top five this week. The remainder of the 3A poll remains the same. Third-ranked Scott City pitched its third consecutive shutout with a 61-0 blanking of Goodland, while Pratt rolled over a short-handed Hesston team, 55-0. Hesston played without quarterback Cameron Cox (knee) and all-state running back Parker Roth (concussion protocol). Kadence Riner rushed for five touchdowns for the Greenbacks in the victory. Top-ranked Phillipsburg made a statement on Friday night with a 42-14 victory over the top-ranked team in Class 1A Smith Center. In doing so the Panthers pulled away in the voting as our clear-cut No. 1 this week. Conway Springs remains at No. 2 after a 38-21 victory over Kingman, while No. 3 Silver Lake defeated Riley County, 31-12 to take control in the Mid-East League race. The Eagles have now defeated Riley County 22 consecutive times. There is a slight change at the bottom of the Class 2A poll this week as Central Plains League members Chaparral and Garden Plain switch places this week. Chaparral moves up one spot to No. 4 after a 42-14 victory over Cheney, while Garden Plain falls a spot to No. 5 despite a 56-14 victory over Wichita Trinity. Despite a 28-point loss to Phillipsburg, the voters keep Smith Center in the top spot in Class 1A this week – a single vote ahead of No. 2 St. Mary’s Colgan. Colgan rolled to a 47-8 victory over Baxter Springs and have closed the gap on the Redmen for the top spot. Both squads have big games this week in a Week 4 schedule that’s littered with big matchups featuring Class 1A teams. Smith Center will travel to Plainville, while Colgan will make the long road trip to traditional power Centralia. Plainville returned to the top five after a victory coupled with Ell-Saline’s loss to Hutchinson Trinity. Elsewhere in Class 1A this week, No. 4 Olpe will take on an unbeaten Jackson Heights team that is yet to allow a point, and Ell-Saline will take on Sedgwick in a battle of two Heart of America League teams just outside the top five. Third-ranked Elkhart rolled to a 68-28 victory over struggling Sublette and will travel to Clayton, New Mexico this week. Defending champion Hoxie remains in the top spot after a 54-0 shutout of Quinter. The Indians have a test this week against a surprising Leoti-Wichita County team that is unbeaten. Central Plains continues to hold down the No. 2 spot this week. The Oilers rolled past Kinsley, 72-0. Central Plains has a key district matchup this week against Little River. Hodgeman County picked up another quality victory by defeating then No. 4 South Central, 28-14. After South Central scored to pull within 20-14, the Longhorns put the game away with a fourth-quarter touchdown. The Longhorns will host unbeaten Kiowa County this week. Solomon moves up a spot to No. 4 after a 48-34 victory over new eight-man member Moundridge. The Gorillas led 40-8 at halftime before Moundridge closed the gap in the second half. Quarterback Braden Neilson accounted for seven touchdowns (two passing, five rushing) for Solomon. Clifton-Clyde enters the poll at No. 5 this week. The Eagles won at Wilson, 66-14, and are averaging nearly 57 points per game. Clifton-Clyde has a tough road test at Hill City this week. The Ringnecks are 2-1 on the season, but are averaging 59 points per game. The battle of No. 1 versus No. 2 didn’t last long. Top-ranked Hanover dominated then No. 2 Mankato-Rock Hills 68-0 in a game that ended at halftime. While Rock Hills played without two key members of their backfield, Hanover rolled to a 28th consecutive victory. Osborne returns to the No. 2 spot after a 68-22 victory over Stockton. The Bulldogs will begin district play on the road at Sylvan-Lucas Unified (2-1). South Barber moves up one spot to No. 3 this week after surviving a key district match against Hutchinson Central Christian. South Barber topped the Cougars 70-68 in three overtimes. The Chieftains will travel to South Haven this week. Otis-Bison moves up one spot to No. 4 this week. The Cougars rolled to a 50-0 victory over Stafford after beating Bucklin 50-0 the week before. Otis-Bison will travel to Satanta this week in a game that could all but wrap up the District 8 title for the Cougars. Finally, Axtell climbs into the rankings at No. 5 this week. The Eagles due of quarterback Quinn Buessing and receiver Hunter Koch is of the most explosive in the state. Axtell blasted Onaga, 48-0, last week and will host Pike Valley this week.